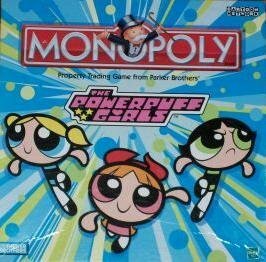 Powerpuff Girls Monopoly Game from the year 2001. The battle begins to buy back the Townsville properties and restore the city. In place of railroads there are Townsville landmarks. This game is yet another version of the classic board game Monopoly. Forces of evil and hot-line cards replace chance and community chest cards. Only one particular can bring the city back to what it once was! Who will conserve them? ! Townsville dollars replace Monopoly money. A Property Trading Game like no other! The fundamental game rules are the same; but what is different is: The board and pieces reflect the Cartoon Network hit show, the Powerpuff Girls. 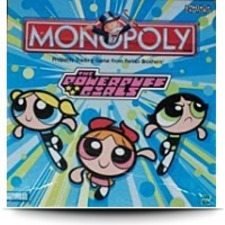 You can also use 3 villain characters with the special Powerpuff Girls optional rules. Will it be Buttercup, Blossom, Bubbles, Professor Utonium, the Mayor, or the kindergarten teacher, Mrs. Keane? The game is for Ages 8+ and is for 2 to 6 players. Powerpuff Girls; the show that produced a hit on the Cartoon Network. The Powerpuff Girls have returned from vacation to find their city of Townsville taken over by villains and in ruin. Townsville properties replace the usual deeds. Package: Height: 2.6" Length: 15.8" Depth: 10.8"